when I found your site. I was thinking the light is a chandelier maybe English Victorian era. The Heads on the side are unique but I have not been able to find any information.The light was switched or converted to electric at some time. 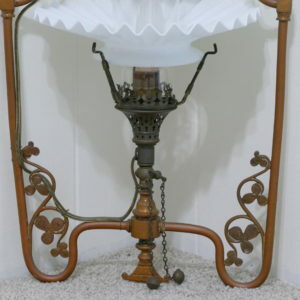 There are characteristic differences between English and American Victorian in the 1880’s which is the time period when this fixture was manufactured. These differences are not available in a fixture like this because its design is so minimal. We call this fixture a Gas Harp or Hall Hoop. 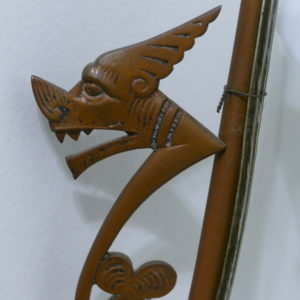 from what I have seen in American lighting fixtures, so you might be right about Great Britain origin. I am familiar with the American Companies but not so much those who worked abroad. 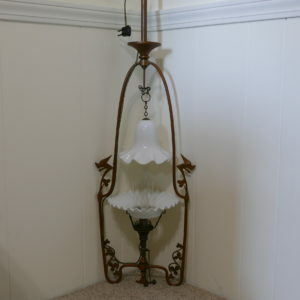 These fixtures were used in halls or over wash stands in corners or against walls. 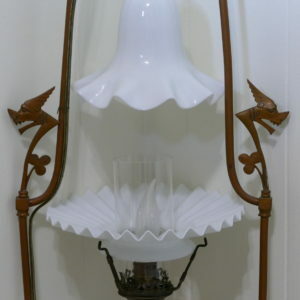 There are quite a few photos in our Design section and if you put Gas Harp in our search box, our Archive of fixtures we have sold will show you similar fixtures. You can use our Glossary of terms.